nothing but "History of Following the Western Art: Japan*,"
prevailed, being called "Japanese-Fashion Fauve," etc. Avant-garde art was also imported in the Taisho Era (c1920). circles in prewar days synchronized with that. just like the past fauvism ("hot figurative," so to speak). Moreover, both suited the Japanese taste. refer to the West. Pop art was imported in succession. reductionistic trends to Japan in a broad sense. similar schema of post-minimalism established in the West. [Early 1990s] --- Simulationism was imported. private art rose just like in the West. of exporting the fashion of Japan. Poetry is a row of letters. A row of letters is sequence. Invent an Imaginary Folk Entertainment." At Sendai Mediatheque on January 10, 2004.
advance orders at MOT THE SHOP. now exhibited being connected with the permanent exhibition. - Solo Exhibition: Gallery Cellar (Nagoya) April 3-24, 2004.
held during the session (further info will be announced). 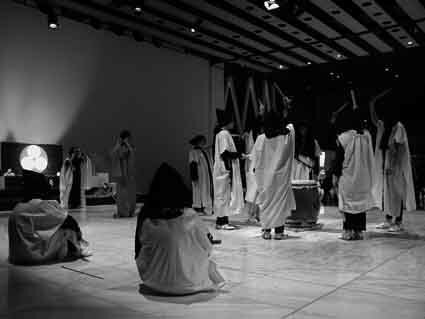 lecture to think on art, at appel (Tokyo) on March 24, 2004.
will be played with Japanese traditional dance. will be performed and its music will also be published.